Everyone else in my city seemed to be at our local Hot dog Festival today. I was not. I have been twice, but since I can't eat gluten the thought of throwing away a ton of hot dog buns isn't appealing. In addition the last time we went I was pregnant with my youngest and they wanted to charge me 10 dollars for a lemonade. We live in one of the poorest areas of the US, 10 dollars seems like a lot of money given that minimum wage is under 8 dollars an hour. Instead I took my boys to the library to enter their raffle tickets for the summer reading program and then when second hand store shopping. I love going thrifting. I grew up with a super frugal mother that made everything from scratch and stretched money better than anyone that I know. I try to be the same way. Right now we need a new desk for our dining room/home office area. I refuse to buy a desk that comes in a box, that I will have to put together and then will commence to fall apart in two years. Instead I am going to look for a desk that needs a little TLC and then redo it. I love redoing old furniture. I stained our dining room table this summer and it looks so much better. Today was a bust, but I might try the flea market tomorrow. Last week was a laid back food week. I haven't been motivated to be in the kitchen for a long amount of time so I have been trying recipes that takes less than an hour start to finish. I tried a new recipe for Smoky Pork Tenderloin with Pineapple Mango Salsa from Family Circle magazine. This recipe has 13 ingredients. It takes 45 minutes of total time, 15 minutes of which is active and makes 4 servings. I made a number of changes to the original recipe. First I made two tenderloins since with three males in my house one just wouldn't be enough. I tried cooking the two tenderloins in the oven and they just didn't want to completely temp in the oven, so I pulled them out and finished in a pan on the stove. Honestly for tenderloin I prefer grilling or pan cooking. Over cooked pork can be tough and the oven method is hard to get to temp evenly. The recipes states to let the pork cook until 145 degrees. With a 10 minute rest this is over done. Meat does not stop cooking once it's pulled out of the oven. It will continue to cook when it is resting, normally 5-10 degrees. I pull my pork out at 135 and it always hits temp after the rest period. Obviously it is up to you with what you feel comfortable feeding your family, but I prefer my pork to still be tender. The pork in this recipe was delicious. The salsa was great also, but I was unimpressed with the mashed sweet potatoes suggested for a side. It was just too sweet and I didn't like the orange flavor. A regular baked potato would be a better side dish or a baked sweet potato if you prefer. As a side note I have decided to start including more photos in my post so there isn't 3 paragraphs with no visual break. I know that I can get bored with too many words, so I am going to make an attempt to show a little bit of my life outside of the kitchen. Today it's photos of my garden, but in the future it will be a variety of scenes from my city and life. Hopefully that will be a little easier to read and give my readers a glimpse into West Virginia life. 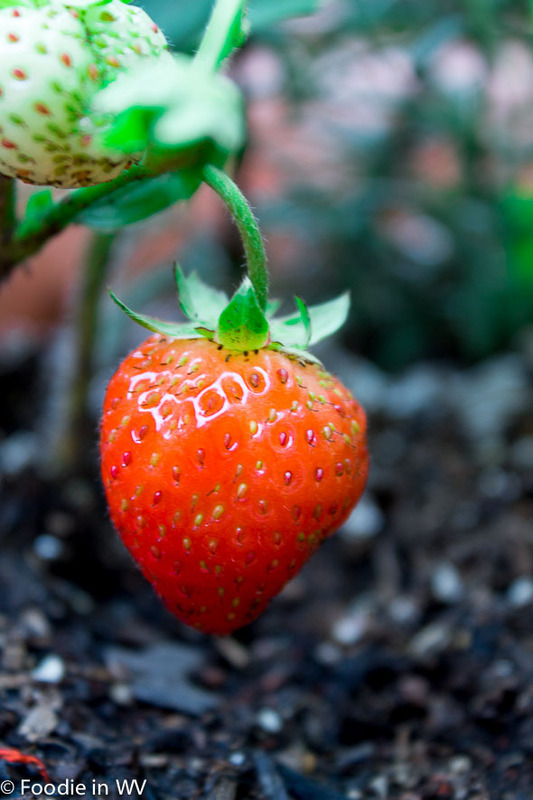 This garden strawberry is looking so delicious.. I love garden strawberries, they are so yummy! I just love strawberries. Ours got stomped on and are in the process of growing back. I'm sorry that your strawberries got stomped, I hope they grow back even better than they were before! Beautiful photos and I agree with you about pork tenderloin. It's tricky to get the temperature right. Thanks :) Pork really is a trickier meat! The furniture in a box does last about two years, tops. Ugh. Good luck finding one you want to redo. It definitely doesn't last long! Your pork tenderloin looks perfect! I love it when it's still slightly pink in the center. Must be juicy and tender. And wow, $10 a lemonade is a bit too much! I love your library plan and 2nd hand shopping much better. :) And so nice you have those beautiful tomatoes and strawberries straight from the garden. I can't wait for mine to get ripen. I love it when it's pink in the center too. My tomatoes are growing like crazy, but so far just a few strawberries :) I should have a bunch in a couple of weeks! Those tomatoes look amazing! I really have got to get in on some home growing! I'm a big thrifter too. This Saturday was 50% off day at our Goodwill, and I needed a new glass baking pan so it was my first stop. I am so glad I did. I picked up two beautiful glass baking pans that I can use to make lasagna, pizza strips and whatever else comes to mind. I always stop at a thrift store when I am looking for something before ever thinking of buying new. The quality is always much better and usually just a little clean up is required. $10 for a lemonade? That's just nuts! I'm so sad we didn't get around to planting tomatoes this year. I have nothing to go with my basil now. My basil has been hit or miss. My old pot (which was stolen) did great, but the new pots had to be started a lot later and they are just now looking decent. Have you ever tried using a brine on a pork roast? I have a salt/sugar one that works fab and leaves it tender and moist. Mix 1/2 cup sugar and 1/2 cup kosher salt with 6 cups of water. Place pork in water for 45 minutes to an hour. Rinse very well so it doesn't end up salty. I love to brine. That is really the only way that I do turkey and whole chicken. It has a great flavor. My husband tries to watch his salt so for pork I normally just grill it or pan sear. He is the picky eater in the house :) Thanks for the idea! Thanks :) yeah, 10 dollars is just crazy! The salsa sounds amazing. I bet that goes well on a lot of things, too! It would be great on tacos! I love this sort of food and you make it sound so easy. Thanks :) It really was easy to make (I promise!). I love pineapple salsa, it's great with fish and pork! 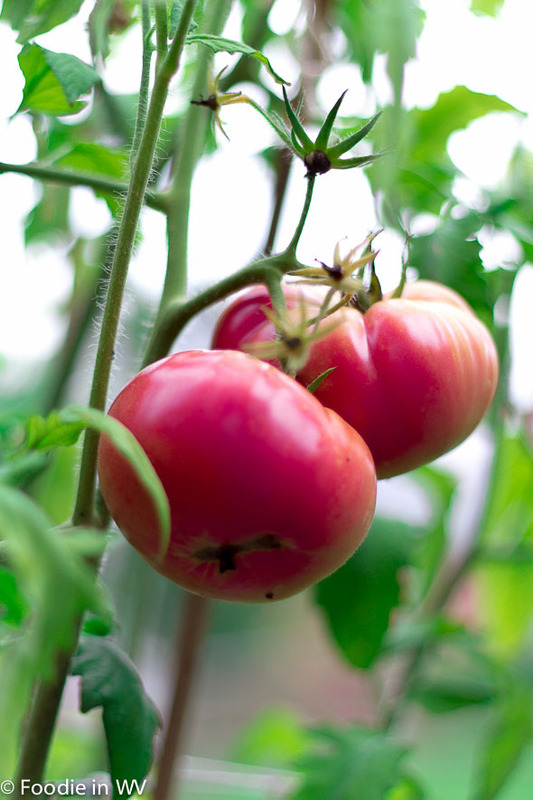 Your garden bounty looks terrific! That strawberry pic is amazing. 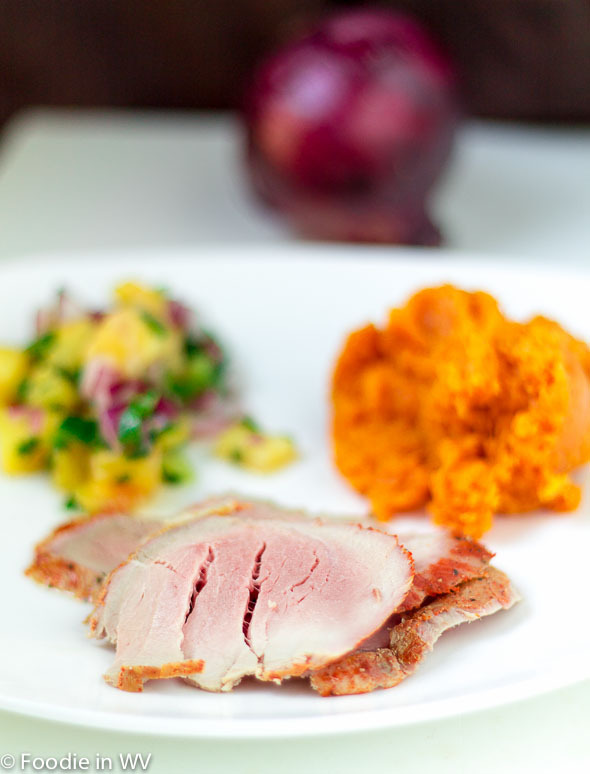 The mango salsa sounds like a perfect side for the pork tenderloin. Also, $10 for lemonade? That is crazy - and I live in NYC! Thanks :) The salsa was a great side. Yeah, I was unimpressed wit the drink prices! My youngest is going to my inlaws at the end of the week, so it should be a good week :) My boys have been fighting all the time, I'm so ready for school to start! Thanks for the sweet comments, if you try the recipe tell me how it turns out!